We have blended the healing and protective powers of Maitake Shiitake and Reishi mushrooms together to create an amazing herbal supplement. Our Herbal Tri Mushroom Blend Capsules are the perfect blend of three of the most unusual mushrooms – Maitake, Shiitake and Reishi. The capsules have amazing immune system boosting properties and have been used by both cancer and HIV patients. We do NOT advocate the use of our Herbal Tri Mushroom Blend Capsules as a cure for either cancer or HIV – but they can be used for nutritional support. Although much has been written about the effects of Maitake, Reishi and Shiitake mushrooms and their apparent benefit for both cancer and HIV patients, we offer you these capsules as a natural way to boost your body’s immune system. Patients suffering from cancer or HIV could discuss the inclusion of our Herbal Tri Mushroom Blend Capsules with their medical practitioner, to perhaps be a part of a supportive nutritional supplement regimen. An immune system that is operating below par will not only result in frequent ailments and illnesses but can also cause you to suffer allergies and slower healing wounds etc. A well performing immune system will not only protect you from infections and opportunistic viruses and bacteria but will also ensure that you can live a lively and healthy life. Stress, modern eating habits, workloads, smoking, deadlines, pollutants etc all have a negative effect on our immune system. If the immune system cannot quickly and effectively deal with problems, body systems will not function optimally. 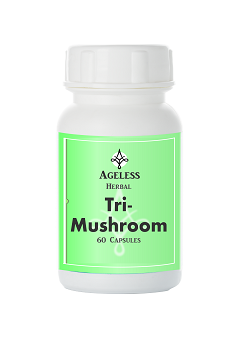 The Herbal Tri Mushroom blend capsules are formulated to boost your immune system and not to detoxify your body as such. If you are looking for a general metabolism boost then rather look at our Herbal Detox Capsules and for a good thorough detoxification of your body consider our Olive Leaf Extract Capsules. Our Herbal Mushroom Blend Capsules have an unique and extraordinary formula in which a blend of various pure herbs and natural ingredients are combined to create this remarkable product. It contains the following herbs and natural ingredients: shiitake, reishi and maitake mushrooms. Take one capsule twice daily with a meal or as directed by a healthcare practitioner. No side effects have been reported if taken at the recommended dosage. Allergic reactions to mushrooms are rare, but these capsules should not be used continuously for more than 3 months. People taking blood thinning medication or women who are pregnant or breastfeeding should first consult their health care professional before taking these capsules. Natural immune system stimulant to boost the body’s ability to fight disease and ailments.